A ν-player whist tournament is a schedule of games, where in each round the ν players are partitioned into games of four players each with at most one player left over. In each game two of the players play as partners against the other two. All pairs of players must play in the same game exactly three times during the tournament; of those three times, they are to play as partners exactly once. Whist tournaments for ν players are known to exist for all ν ≡ 0,1 (mod 4). The special cases of directed whist tournaments and triplewhist tournaments are known to exist for all sufficiently large ν, but for small ν several open cases remain. 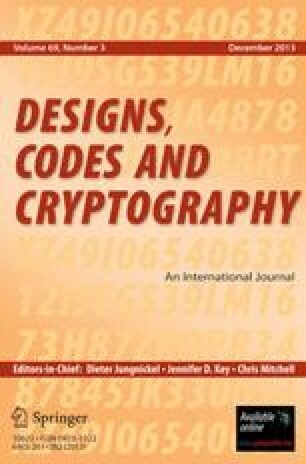 In this paper we introduce a correspondence between near resolvable 2-(ν, k, λ designs and a particular class of codes. The near resolvable 2-(13, 4, 3) designs are classified by classifying the corresponding codes with an orderly algorithm. Finally, the thirteen-player whist tournaments are enumerated starting from the near resolvable 2-(13, 4, 3) designs. Both authors were supported by Helsinki Graduate School in Computer Science and Engineering (HeCSE). In addition, the first author was supported by a grant from the Nokia Foundation and the second author by a grant from the Foundation of Technology, Helsinki, Finland (Tekniikan Edistämissäätiö).